Walk to the gravel parking lot behind the Bethania Mill. The trail starts towards the left end of the parking lot (if you stand with your back to the mill). ?Trail Directions: Pass the trail head sign for the Graveyard Hill Trail. ?Pass through some woods and an old field where small trees are taking over and bear left. At 0.2 miles, enter the deeper, older God’s Acre Woods where a short path leads left to the God’s Acre, Bethania’s Moravian Cemetery. 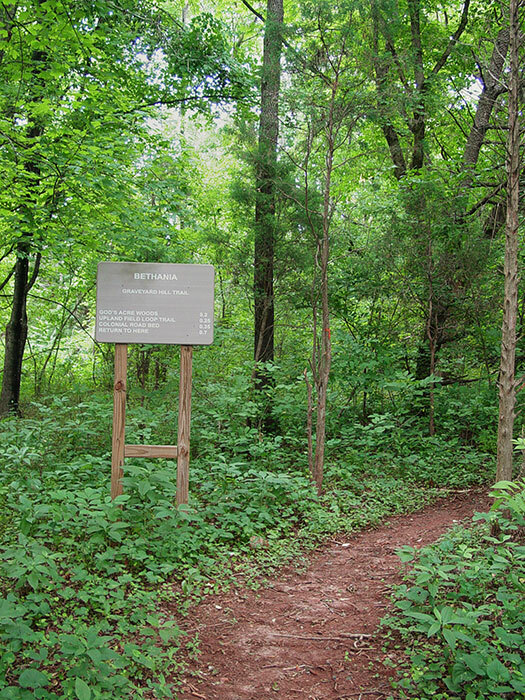 ?Continue on the Graveyard Hill Trail by going straight and at 0.25 miles, reach the edge of the upland field and the start of the two-tenths of a mile loop. This upland field was once identified as one of the most threatened historic landscape elements in Bethania and Forsyth County. Go left, follow the trail around the upland field and at 0.35 miles reach a short side trail that leads to the edge of the old colonial road from Bethania to Bethabara. Lord Cornwallis led his 1,800-man army along this road on the morning of February 10, 1781 as they left Bethania and continued their pursuit of Nathaniel Greene’s patriot army which began after Daniel Morgan’s patriot force soundly defeated Banastre Tarleton’s British forces at the Battle of Cowpens in South Carolina on January 17, 1781. 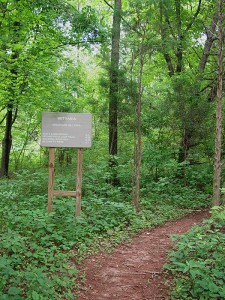 At 0.45 miles reach the end of the loop portion of the trail. From here, one turns left, and retrace your earlier route and return to the parking lot behind the Bethania Mill. The protected land on which this trail runs was made possible through the efforts of the Piedmont Land Conservancy and former landowners. The funds to purchase the land came from numerous donors and from the North Carolina Natural Heritage Trust Fund.